Using a bread machine makes it so easy to have fresh bread any day. 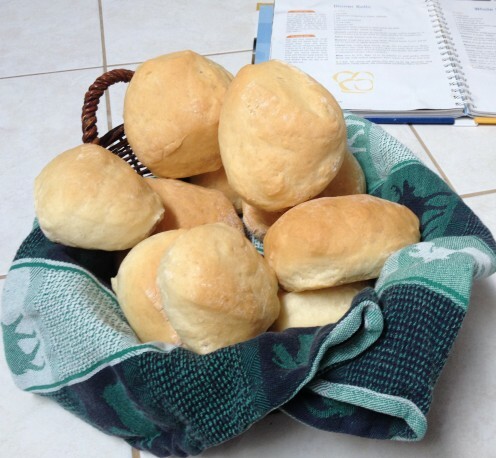 Lately I’ve been making dinner and sandwich sized rolls with it so I can use the fresh bread for hamburger buns. This time I cut off a piece to try my hand at calzones. A calzone is another recipe that is surprisingly adaptable. Not only can you use your favorite ingredients and cheese, you can also leave the veggies uncooked when you make the calzone and allow them to cook a bit longer within the calzone. Since this was my first try, I decided to go for the flavor burst you get with sautéing. Making and baking the calzone is very quick and easy. It is a very fun way to experiment with your bread dough too. If you prefer, you can make one large calzone instead of the two smaller ones. For ease of eating I prefer the smaller size. Prepare the bread dough according to recipe below. You can use a package of Pillsbury refrigerated dough or pizza dough if you prefer. Prep veggies and cheese while the bread machine does its thing. When the dough is ready, remove from bread machine. Allow it to sit as is for 10 minutes. Add garlic and onion for 2 more minutes. Add spinach, cover, and heat until the spinach is wilted. Set aside. Slice ¼ of the dough (enough for two servings). Roll out on a floured surface (I use parchment paper), until it is about 10 inches across. Divide the mozzarella cheese onto one half of each of the rolled out crust, saving some for the top. Divide the sautéed vegetables on top of the cheese. Add the rest of the mozzarella, then sprinkle each with 1 tablespoon romano cheese. Fold over and secure edges all around. Spray the top lightly with pan spray. Place on parchment paper on a baking pan. Bake for 15 to 20 minutes or until it is nicely browned. This is the bread machine I love and use. If you would like to read my review of the machine, you can click right here. It fast became a favorite when I received it as a gift several years ago. Since then it had made so many loaves of bread, pans of cinnamon rolls, dinner rolls, hamburger buns, and more. I still haven’t tried it to make pasta dough, but that is on my list. 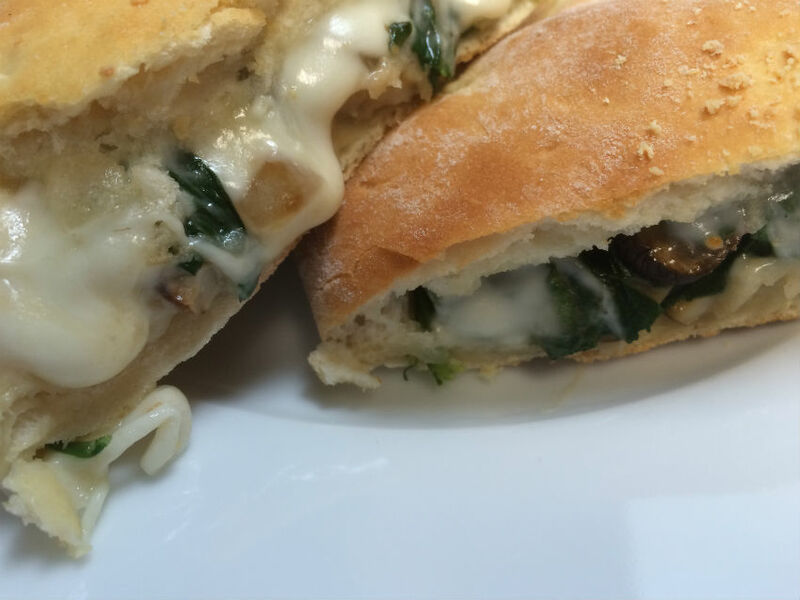 Want more calzone ideas? You will find a selection here. A Chez Panisse cookbook, you will find a lovely variety of pasta and pizza as well. I’ve grown to prefer rolls to a loaf of bread, mostly because I can make the rolls in differing sizes and freeze them. You’ll find it is so easy to make them a size you like. Often I will do one pan large, and one pan small. One batch makes plenty that way. Don’t worry too much about shaping the dough. You can simply cut the dough and very gently shape the edges, then as it rises it seems to shape itself into near circles. I like to freeze most of the rolls fresh out of the oven. I’ll let them cool 10 to 15 minutes then place in a zip bag. That makes it so easy to grab one or two when fixing a burger or a sandwich. They taste freshly baked that way. Place all ingredients in bread machine according to your machine directions. Run on the dough cycle. When finished, remove from pan with floured hands, and set on floured parchment paper. Divide dough into pieces, about 3 inches a round. Lightly shape into a ball. Set on parchment lined cookie sheet. Cover and let rise in a warm place for 45 minutes or until double in size. Bake rolls 10 to 15 minutes until nicely browned. To freeze, cool about 15 minutes then seal in a zip bag. 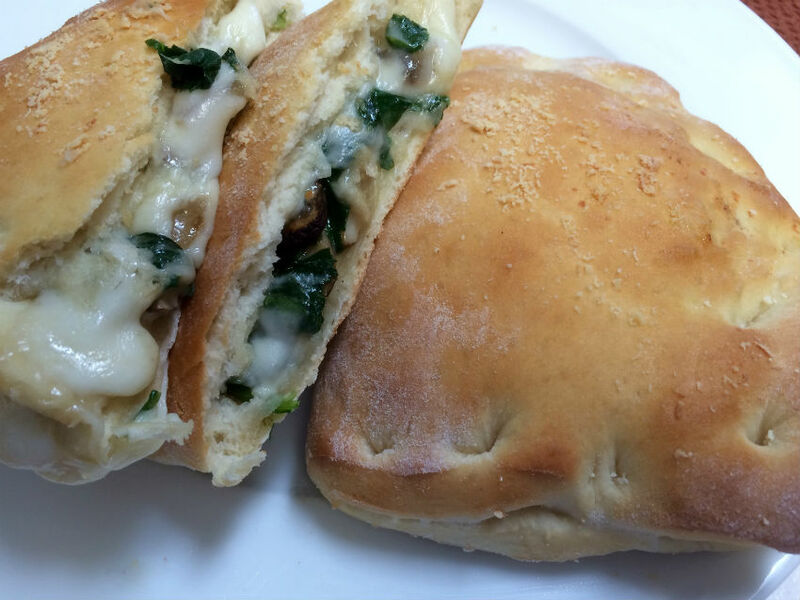 A delicious homemade calzone, freezable for a quick lunch. Puff pastry is used for the crust, with spinach, mushrooms, and mozzarella for the filling, served with a side of marinara. Hi Monica, and thanks for your comments. I’m sure you could substitute, though I haven’t tried it with this particular recipe. I’d try one cup at first. Usually I just use a whole wheat recipe I have instead when I want a wheat version. If you need a whole wheat recipe, just let me know and I can send you mine. Thanks! These look awesome!! I’m trying to work more whole wheat into my diet. Do you think this dough recipe would work with half whole wheat flour? Have you experimented with that at all? Hi Monica, sure, it would be great with whole wheat dough. I often make wheat bread and rolls in the bread machine. I haven’t tried substituting it in this recipe, but I will try it next time. You might start by substituting one cup for one cup of bread flour, and watch to see if it is moist enough. I have a wheat recipe I like in the bread machine. If you would like that let me know and I’ll send it to you. Hope you try it. Jackie and I discussed the next batch–it has to be a tuna melt. Thanks! Thanks Jackie, it tasted like it at the time. Next stop tuna!